The Rowley Mile at Newmarket races is well known as one of the most famous racing venues in the UK. Many different buildings have been erected since the late C18 when the first races were held. The practice were asked to prepare drawings for the redesign of some of the main buildings on the site, together with a master planning exercise to rationalise the hospitality offer. 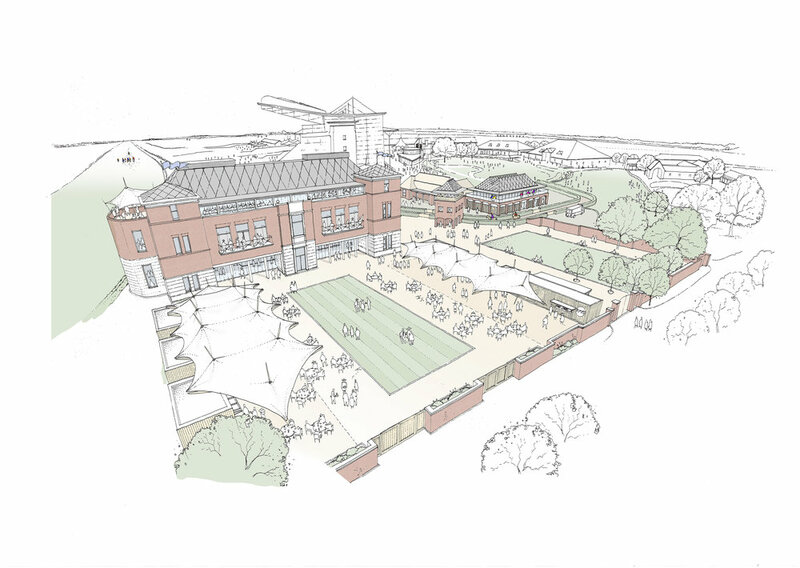 Our scheme creates a new Kings Stand, placed at the finishing line of the Rowley Mile, with a new courtyard behind, forming a main entrance to the site from the existing car parks. The court provides a gathering space, food halls, bars, restaurants and ticketing, under stretched fabric ‘tents’ held on mast structures. The space allows for independent events when there is no racing, increasing the potential business scope for the Racecourse management. The Kings Stand creates new restaurants on the top two floors, with seating facing the race finish. The top floor restaurant opens up into a diagonal braced roof structure expressed on the outside in the zinc roof finish. The ground floor creates a large bar facing the new courtyard. The original C18 Kings Stand is recreated using old drawings as inspiration. The design creates a three-storey building overlooking the route for the racehorses as they proceed to the start line. A restaurant for private parties and a viewing platform at the top create a fine new addition to the hospitality offer. The competition also looked at a rationalisation of the ‘Weighing In’ building and the Jockeys facilities.